Ireland also has the fourth highest rate of teenage suicide in the EU, as reported by Building the Future, who state that 1 in 10,000 Irish 15-19-year-olds will die by suicide. The brutal austerity measures imposed by the Fine Gael-led government have fueled the desperation people are feeling around the country. The poorest areas in the country are the worst affected, with suicide rates in the most deprived 20% of areas shown to be twice as high as in the richest 20%. Risk of homelessness, cuts to services, unemployment and low-paid precarious employment are all factors that contribute to mental distress and lead some people to take their own lives. But the government has clearly decided to abandon entire communities to their fate. It is not just the poorest in society who suffer from mental strain, of course. Many people who bought houses before the 2008 financial crash are now in mortgage arrears and are at risk of eviction. Data from the Irish Mortgage Holders Association showed that 31% of people who were in arrears had recently had suicidal thoughts and 22% of these had active plans to commit suicide. The logic of the system is such that the profits of the banks and landlords are considered untouchable, even at the cost of human lives. There has also been a huge increase in the strain placed on public service and white-collar workers, as the state cuts services and private businesses attempt to push workers to their absolute limits. From nurses being run off their feet for 13-hour shifts to private sector pay and pension cuts, the assault on workers has been vicious. While increasing numbers of people are driven to despair by the system, the government has done nothing to alleviate their mental suffering. Like the rest of the public health system, mental health is chronically underfunded. 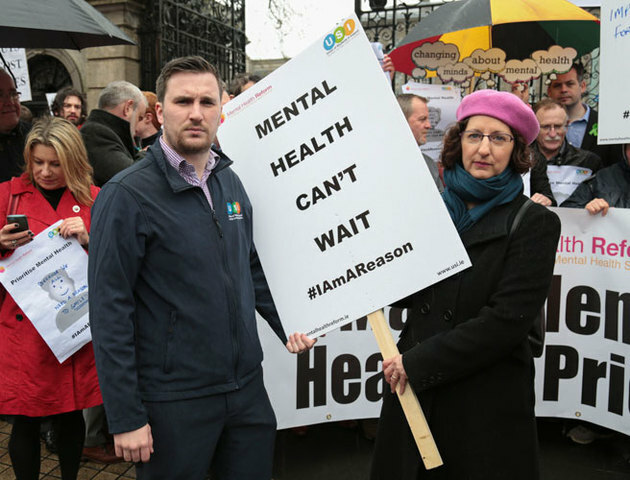 The government attempted to pull the wool over the eyes of the public last year, stating that they were providing an additional €35 million for mental health services as part of their Vision for Change policy. However, €20 million of this was, in fact, announced in 2016, and the actual increase only amounted to €15 million. This follows on from the €12 million earmarked for mental health that was allocated to other areas of the health service in 2016. The results of this are born out in cuts to acute psychiatric beds, an over-reliance on medication as a front-line treatment, and patients who try to access psychological therapies being left waiting 6 months or more to access treatment. Fine Gael’s policies are a double assault on mental health in Ireland. Their austerity measures and attacks on workers drive vast numbers people into desperation, and when these people seek help through the health system, there is no help there for them. Our response must also be a double-pronged. In the short term we must fight for a massive increase in spending on mental health services so that those who require help are not left to suffer alone. Our long term goal must be to tackle the root causes of mental distress by fighting to create a socialist society that looks after the needs of everybody who lives in it, and allows them to develop to their fullest potential.